Retired Air Force Lt. Col. Richard Cole and former Deputy Commander-in-Chief of the Republic of China Air Force Patrick Chen.Courtesy of the Taipei Economic and Cultural Representative Office in the United States. 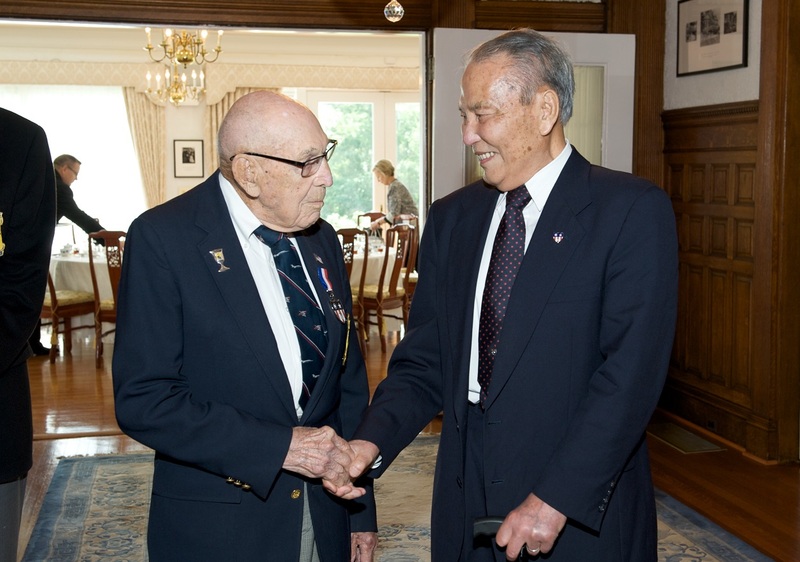 Two legends met for the first time last week, when one of the two surviving Doolittle Raiders was introduced to a former Chinese general officer, who flew with the 14th Air Force, heir to the famous Flying Tigers. Lyushun Shen, Taiwan’s top diplomat in the U.S., held a May 19 luncheon with retired Air Force Lt. Col. Richard Cole, the co-pilot for then Army Lt. Col. James “Jimmy” Doolittle, and former Deputy Commander-in-Chief of the Republic of China Air Force Patrick Chen. In 1940, Chen was selected by retired Army Maj. Gen. Claire Chennault to go through flight training in Arizona, according to the Republic of China’s diplomatic mission in the U.S.
Chennault recruited 84 former U.S. military pilots as part of the American Volunteer Group, or “Flying Tigers,” which is credited with shooting down 296 Japanese aircraft in China and Burma between Dec. 20, 1941 and July 4, 1942. After the American Volunteer Group was disbanded, a small number of pilots remained as part of the China Air Task Force, which became the 14th Air Force on March 5, 1943. “Members of the China Air Task Force and the Fourteenth Air Force are, in English, often also referred to as ‘Flying Tigers,’” according to the U.S. Embassy in Beijing’s website. “There is some friendly rivalry between the original Flying Tigers and the Flying Tigers of the Fourteenth Air Force about who has ‘bragging rights’ to the name. Generally, however, anyone assigned to China under the command of General Chennault (in the American Volunteer Group, the China Air Task Force, or the 14th Air Force) is called a ‘Flying Tiger’ in English. Chen began flying a P-40 Warhawk fighter with the Chinese-American Composite Wing of 14th Air Force in 1943, and he went on to shoot down two Japanese aircraft: A Mitsubishi A6M Zero fighter and an Army Type 99 “Lilly” twin-engine light bomber, according a news release from the Taipei Economic and Cultural Representative Office in the United States. Cole was in Washington, D.C., last week for the world premiere of the documentary “Doolittle Raiders: A Final Toast,” which will air on PBS this fall. Funded by the American Veterans Center, the documentary looks at the final Doolittle Raiders reunion in 2013. During the luncheon with Chen, Cole and his daughter were able to thank the son of Ruan Yicheng, the Chinese official who led efforts to rescue the Raiders after they crashed or parachuted into Japanese-occupied territory.